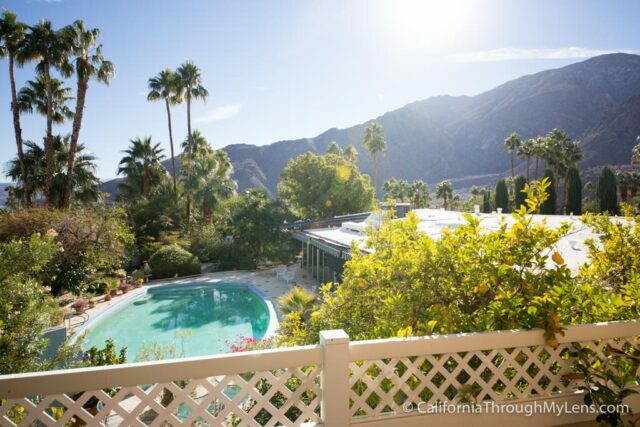 When researching things to do in Palm Springs I stumbled upon the honeymoon home of Elvis Presley and figured it would be a good half day adventure outside of the normal shopping and eating that everyone does in Palm Springs. 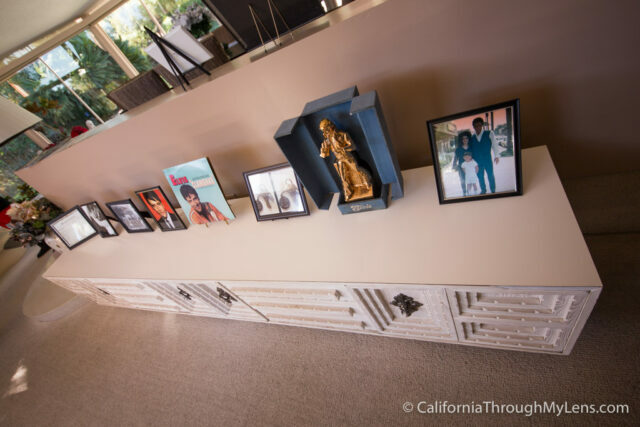 The house itself is one of the only celebrity homes you can visit in the city, it has been maintained since when he stayed there and it is currently open for tours that you must set up in advance. This is the type of thing that I like to do when I travel, so I called and booked a tour for the following day, here is all the information. 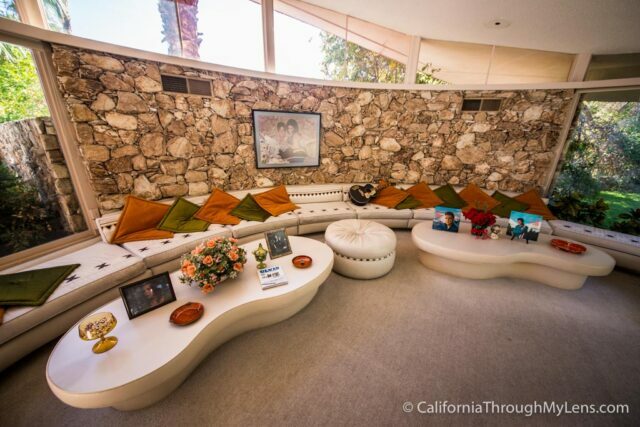 This house was leased by Elvis when he was 31-32 for one year. 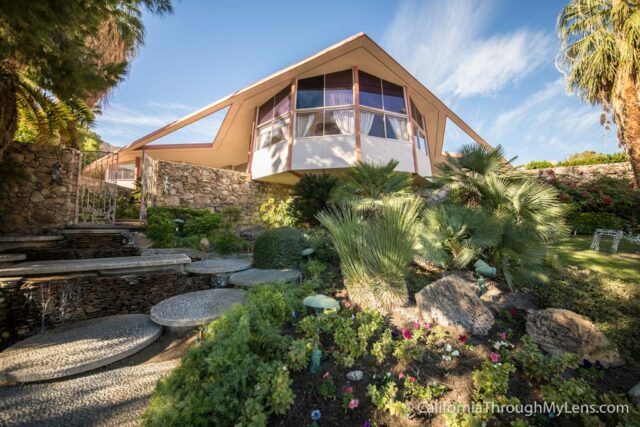 It was deemed the house of tomorrow due to many of its advancements such as vacuum ports for cleaning, indoor kitchen grill and wall mounted radios. He never actually owned the house, just leased it for a year for $21,000. He was originally supposed to get married here but once the press caught wind of that he snuck out the back and flew to Las Vegas to have a private wedding. They flew back and spent 4 days here for their honeymoon before Elvis had to go back to work filming a movie. 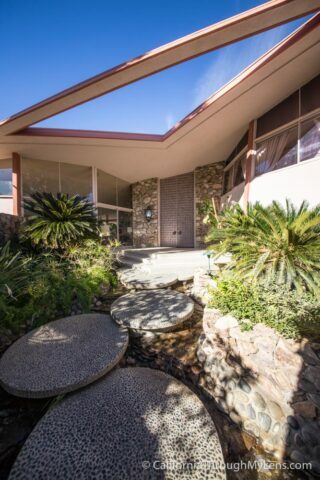 The 5,500 square foot house is currently on the market for 7 million and when / if it sells it is up in the air whether or not there will still be tours, so go now if you are interested. When you arrive about 5 minutes before the tour is scheduled to start, you will park in the cul-de-sac and walk up the awesome stone stairs that cross over water as you make your way to the front door. The house itself looks a lot like a spaceship when you are walking up to the door and it really is one of those houses that you will not forget when you see it. I arrived 10 minutes early and sat outside the door for a few minutes before I was greeted to check in for my tour. There was only 4 other people on the tour with me so it was small and gave us the ability to ask questions and take our time. Here are some photos of what you will see on the tour. 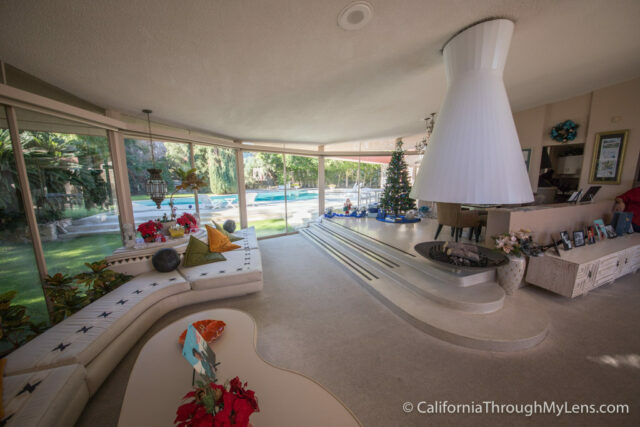 Complete with a 64 foot couch and a fireplace in the center of the room, this living room was my favorite room in the house. 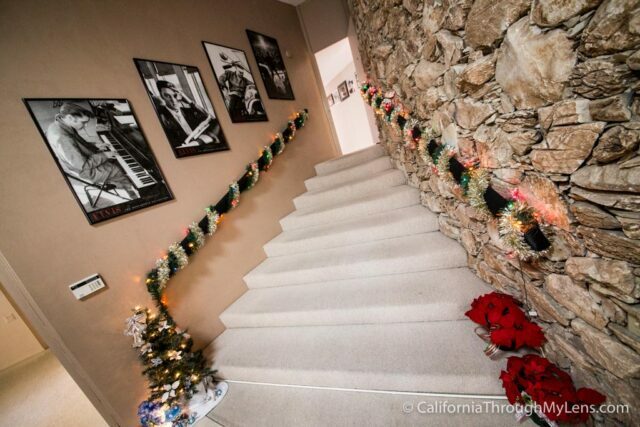 They do a great job putting photos around the house to show you Elvis interacting with the different rooms. 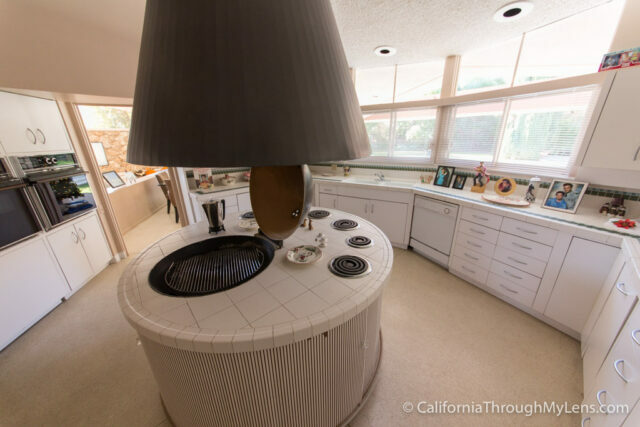 The kitchen is relatively small but it has a large fridge and a built-in kitchen BBQ. 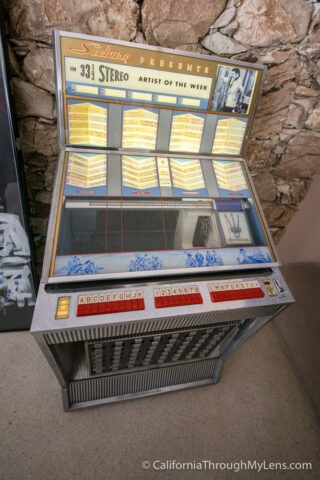 The old jukebox they had here was fantastic and it worked well, I even got to pick a few Elvis songs to play on it. 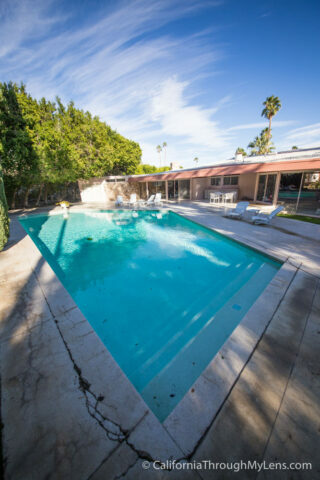 The backyard is amazing with lots of room and a big pool. I imagine this being a fun spot for parties back in the day. 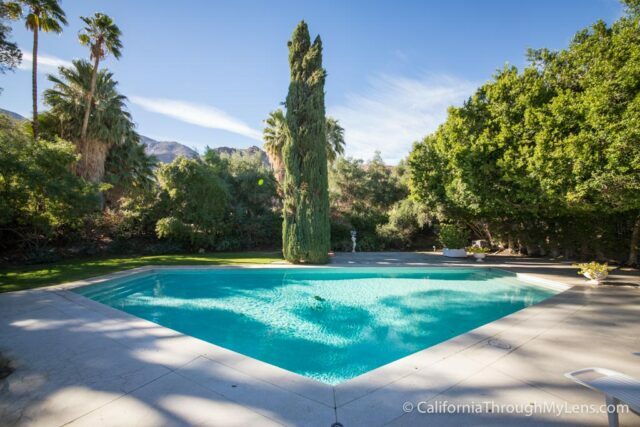 In the back property it overlooks Marilyn Monroe’s house which is privately owned but you could see the pool. Heading upstairs brings you to the main bedroom and bathroom. 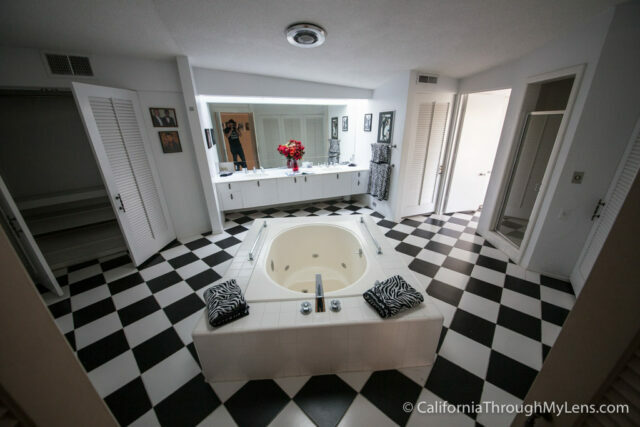 The upstairs bathroom has a large sunken tub right in the middle and fun black and white tile. The master bedroom is set up to look out of the space ship like windows and down on the street below. I thought this bedroom was pretty sweet as it was really open and inviting. After we spent an hour walking around the house the tour was over. The guides here were fantastic though as they let you interact with all of the different things in the house including laying on the bed, sitting on the couch for photos and playing music from the jukebox. This makes for a fantastic tour that while expensive, is a fun way to interact with this unique history. 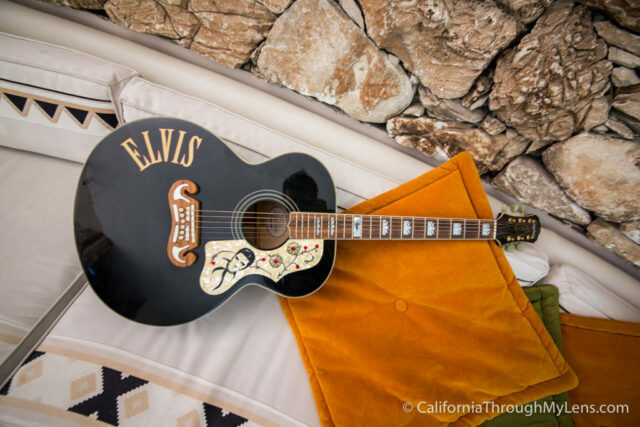 I can’t say whether it would be worth the cost for you, but I was happy I paid a visit to this house as it was a great example of the style of the time period and a way to get to know the famous Elvis Presley a little more.